The word chakra is a Sanskrit word meaning wheel. Our chakras (energy centers) move like a wheel - clockwise, anticlockwise or standing still or other more erratic movements, depending on what is going on with us energetically at any given time. 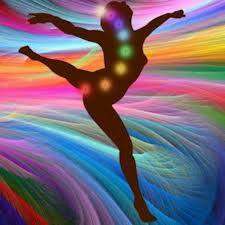 We have many chakras (energy centers) on and off of our bodies. We are like an orchestra! When one of our chakras is 'out of tune'. our whole being is out of order and we don't function like we should. Having your chakras balanced allows you to feel, think and function is a more balanced way. Life has it's little and big ups and downs. We are affected by people, our environment and all the experiences we have had since childhood. All of these things cause our chakras to shift. Regular chakra balancing sessions will help you in all areas of your life. You just lie on the table fully clothed and allow Dr. Karen to balance each chakra! Chakras are affected all day everyday by our thoughts about ourselves and others. As we become more balanced, our thoughts become more harmonious. As our thoughts become more harmonious, we become happier and healthier! Who should have their chakras balanced?